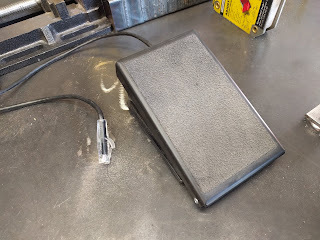 Tig welding pedals are expensive, mostly over $100. Miller wants $150 for the RFCS-RJ45 pedal that goes with the Multimatic 215, and $600 for their wireless pedal. So I'm not the first person to wonder whether something cheaper like a musician's expression pedal might work just as well. The RFCS-RJ45 is unusual in using an RJ45 connector instead of the more common 14-pin connector. RJ45 is less rugged but very common, and one nice feature of the RFCS-RJ45 is an RJ45 socket inside the pedal, so that the cable can be replaced with a standard ethernet cable using just a screwdriver. 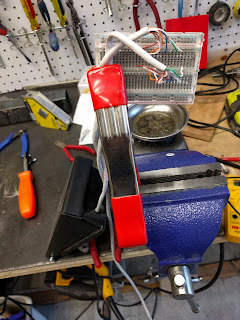 So the simplest pedal we might imagine would be, say, a 1K potentiometer on pins 1-3 for current control, and a switch connecting pins 6 and 4 to start welding. Miller did something more interesting than that, though, as we can see when we look inside. No moving parts! Potentiometers can be finicky and unreliable over time, as everyone knows who's ever owned a stereo with a scratchy volume knob. And in fact audiophiles often pay over $100 for really high quality pots. So miller opted instead to use a hall effect sensor instead. 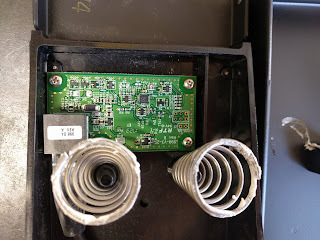 The screw you can see on the underside of the lid holds a little magnet, and U3, the little 3-pin IC between the springs, is labeled 324, so it's probably this hall effect sensor. Also of note is the pic 16f689 microcontroller the pair of chips marked VBHI, which are probably these op amps, and U5 marked D2B, which is probably this 8-bit DAC. So I'm betting one op amp cleans up the signal from the hall effect sensor, feeds it to the pic which applies factory calibration data, and then uses the DAC to generate the simulated potentiometer output, which is then scaled up to the 0-10V range by the second op amp. I sacrificed an ethernet cable and used a breadboard to break out the 8 lines. I measured voltage and current on each pin of the RJ45. 12-15mA flows from pin 1 to pin 3, so the board seems to be using the 10V supply to power itself. Pin 2 has the 0-10V signal reporting foot position. Mine doesn't pull quite all the way to 10V, but it gets pretty close. I was a bit surprised to only read 40-100uA of current flowing through pin 2. Since welding is so electrically noisy, I figured they might draw several milliamps from the sense line to drown out any picked up noise. But I also imagine there are plenty of pedals floating around the market that use high resistance pots which would sag under that load, so 100uA seems to be the compromise they chose. Pin 4 does indeed have around 15V on it, with no observable current flowing through it. Pin 5 doesn't seem to do anything on the multimatic 215. According to the manual, pin 6 should get tied to the 15V on pin 4 to enable the contactor, but my RFCS-RJ45 only pulls up to about 9.8V when I press the pedal. Not too surprising; they were already working with 10V and didn't want to get the 15V rail involved unnecessarily. 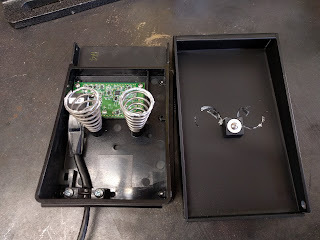 I measured 650uA flowing through this pin when the switch was pressed. Nothing of interest on pins 7 or 8. 1. You need to control the contactor somehow. One option would be to use a switch separate from the foot pedal, and musician gear has plenty of those. In such a setup, your foot has to find the switch, get back to the pedal for current control, then find the switch again to shut off the arc. (And don't bump the switch on by accident, because now you've got a torch that's hot until you hit the switch again). But if you want the traditional single action, you'd need to, say, rig up a switch to the expression pedal for contactor control. 2. A brief search suggests that expression pedals use 10-25k ohm pots. A 10k pot across 10V flows 1000uA, so the 40-100uA drawn by the welder is enough to cause some sag, but you'd probably get away with it. 25k might be pushing it. Also, I see some reports that the EP3 pedal in particular has a logarithmic response, whereas you probably want linear for welding.